The debate over Highway 1 widening has North County and South County in a bitter split. And it's only going to get uglier. As anyone who has ever sat on Highway 1 reading the bumper stickers on the car in front of them knows, traffic on the county's central artery comes to a nightmarish standstill during peak hours. This is a highway that officially reached capacity 22 years ago--and its projected future car load isn't going anywhere but up. But the debate over what to do about it has so far done little but split the county into two bitterly opposed factions. 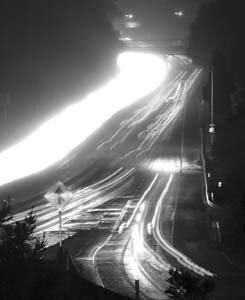 With so much grumbling over gridlock for so long in Santa Cruz County, it's hard to believe it was only two years ago--when the Santa Cruz County Regional Transportation Commission (SCCRTC) voted to make widening the highway its "number one priority"--that the push for widening Highway 1 materialized into some concrete planning. The vote passed by a majority, but not unanimously, thanks to opponents in the city of Santa Cruz. That doesn't bode well for the future of a widening project that once looked to be a done deal. Funding for the Highway 1 widening/HOV lanes project does not currently exist. The estimated cost is $300 million, money that neither the state nor the federal government is willing to supply. That leaves the burden of funding this project largely on local shoulders. A recent poll puts support for a tax measure that would fund highway widening and other transportation projects at 64 percent--close to the two-thirds mark it needs to pass. But here's the catch: according to Linda Wilshusen, executive director of the SCCRTC, a sales tax measure has rarely passed in this county without the support of Santa Cruz proper. And guess what? It's not going to get it. Although it's not without its exceptions, there is a general trend which can best be summed up as "the farther you get from the city, the more support there is for the widening." "I have never had anyone in Watsonville come up to me and say they think this is a bad idea," says Commissioner and District 4 Supervisor Tony Campos, whose district encompasses the South County, including Watsonville. 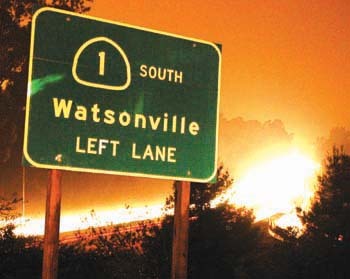 "I think that almost everyone in Watsonville strongly wants this highway." This split between city and county--or to put it another way, between North County and South County--is a key part of this debate, and it's likely to heat up as budget massacres threaten the project. Ironically, it's also a divide that few of those actually involved in the debate want to address, at least directly. But read between the lines of what South County supporters have to say about it, and you'll find thinly veiled charges of classism on the part of the widening's North County opponents. "Most people who work in Santa Cruz are going to have to somehow get there," says Campos' assistant, Edenielson Quintanilla. "Most go on the highway, and these are people who do everything from servicing hotels to cleaning people's homes to yards to working in banks--all types of jobs. An hour that is spent on the highway is an hour that a person and a business loses, because people are just sitting on the highway, and that's a real money issue." Commissioner Jan Beutz, who is the District 1 supervisor for the area including Live Oak, also believes that her constituents want the highway widened, and she suggests it's payback time for the city of Santa Cruz. "I think that you have to look at transportation from a countywide perspective," she says. "We spent a lot of money up on Mission Street, and that was community money. For different areas of the county, probably the highway is more important. For midcounty and South County it is a real vital project. To think it's OK for them to be sitting in traffic for hours at a time is unacceptable." Opponents of the widening project, however, don't see their position as elitist, but as principled. For people like ex-mayor of Santa Cruz Chris Krohn, the integrity of the city of Santa Cruz is at stake. Krohn is concerned about what he calls "the broader progressive political agenda" of Santa Cruz. "I think there's a lot more to be gotten out of the town that fought the highway widening rather than succumbed to it," he says. "As far as commerce goes, as far as tourism goes, as far as quality of life of the residents goes, I would see it as a major defeat of the progressive project that's been going on for in Santa Cruz for a long time." Concerns about the political agenda are just the tip of the iceberg for opponents of the Highway 1 widening--they also see it as short-sighted and a threat to sustainable development. "It will cause sprawl," says Paul Elerick of Citizens for Sustainable Transportation. "As soon as you build it, it will just fill up." Nor does Elerick consider the widening the only option for solving the county's transportation troubles. "There are other projects that are being ignored here," he says. "We need to look at all the options, the rail lines, the bike paths, improving buses. We can't be looking to this as a quick fix, because it's not." Concerns about the plan being short-sighted are shared by Commissioner and Supervisor Mardi Wormhoudt, whose District 3 covers the city of Santa Cruz as well as Davenport and Bonny Doon. Wormhoudt was the only supervisor on the commission to vote against making widening the highway a top priority. "This kind of project usually has about three years of sheer hell due to construction, and then about three years of improvement and then you're right back where you started," she says. "So I don't see it as a very good use of transportation dollars. Ultimately, I don't think widening roads is going to improve our traffic situation." Though the widening was once considered to have broad support and a bright future, opponents have seen momentum shift somewhat in their favor. The first portion of the highway widening plan, the 17 merge-lanes project, is already stalled due to a shortage of funds from the state. "That money is just not available at the state and federal level for us," says Wilshusen. "We're a tiny little county, and almost all the allocations we've had in the last 10 years have gone into this project [the 17 merge-lanes project], and even now we can't get that project going." The sales tax to fund transportation projects will go on the general election ballot in November 2004. "We're going to have to do it ourselves," said Wilshusen. "If the people of this county want to widen this highway, they're going to need to vote the money to do it." Not everyone, of course, thinks that's a good idea, and opponents consider themselves to be on solid populist ground on this one. "I really am uncomfortable with using sales tax on transportation," said Wormhoudt. "Highways have always been funded with gas tax. And that's fair, it's a users' tax--people who use the roads and highways pay the tax and get the benefit. A sales tax is paid by everybody, whether you drive a car or don't drive a car, or only ride your bicycle, or are a senior who hasn't driven in 20 years, and it's a regressive tax in that everybody pays the same amount of sales tax, whether they're rich or poor." In addition, the decision by a cash-strapped city to put an unrelated quarter-cent sales tax measure on the March ballot may make it harder to get voters to sign off on the half-cent sales tax measure which would raise monies for Highway 1 widening and other transportation projects in November. Councilmember Cynthia Mathews says, however, that the March measure was a question of survival, not sabotage, and that the city didn't have the luxury of considering how it might or might not undermine support for the Highway 1 widening. 'It was not our intent," she says. "These are two utterly different issues. Some people will be supportive of both, others not, but the city absolutely could not wait. Even Councilmember Mark Primack, who is in favor of highway widening, voted to put the city's measure on the ballot this March." Still, don't expect supporters of the widening in other parts of the county to give up any time soon. The commission still considers the project its highest priority, and will redesign and resubmit the sales tax measure if it doesn't pass in November. "You often do go more than once on a measure," says Beautz. "I think this is a difficult time to do a sales tax. If it fails, we will do exit polls so that we can try it again and give people what they want." In the meantime, the commission is going ahead with forming a separate joint powers authority (JPA) to oversee the construction of the highway. Currently, a working JPA is in place until the final JPA can be formed. All of the details and plans, including contracting decisions and budgets, will be the responsibility of the JPA. It's not hard to see this as an attempt by supporters of the project to shore up some momentum away from its very vocal opponents. "I think it's important that we have the JPA," Campos said, "a body of people that represent the community away from the SCCRTC. Because their main sole task will be to widen Highway 1, and that's all they're going to do. They'll give out the contracts, they're going to bring in consultants, they'll do whatever needs to be done, and it will be done specifically for Highway 1." Opponents, of course, don't like this one bit. "To me, in some ways this seems very irresponsible," says Wormhoudt. "The only time they set up a joint powers authority is when the project covers more than one jurisdiction. For example, Highway 85 goes through two or three different counties, so no one transportation commission could have done that project, so they set up a joint powers authority made up of members of each of those commissions. You don't need that in Santa Cruz because this project is contained fully within Santa Cruz County. Now secondly, even if you wanted a separate authority because you said, 'We just want to be really, really focused, we just want to concentrate on this'--even then, to form it before the voters have passed this tax, you are spending all this money on staff, on an office." In one more not-so-subtle sign of the rift between North and South county on this issue, the city of Santa Cruz turned down the opportunity to have a seat on the JPA, citing concerns over financial responsibility. They would have been the sole voice of opposition on the JPA. Whether or not the sales tax measure passes, this is an issue that will be debated heavily in the next few months and years--and, at this point, no one seems ready to call the outcome. "There's no one thing that stands out as an easy answer," Wormhoudt says. "I think that what you have to do is piece together parts of other various alternatives in order to make some progress." Supporters of the widening, though, say they're tired of talking about alternatives, and they want action a.s.a.p. "Most people in this society, the way our lives are set up, are going to drive," said Beautz, "and to pretend that we can somehow change that, I think you're kidding yourself. Lives are complicated. We've done quite a bit for alternatives, and that will work for some people, but the majority of the people, that's who we need to pay attention to. And the majority of the people, at least the people I've talked to, are tired of sitting in traffic."